Time is over. Next Sunday the 20th, Spaniards will put an end to an exciting political year. The Spanish general election to the Congress and the Senate will be held and a huge change in the history of Spain may happen. For about 33 years, only two parties have been able to form a goverment: Partido Socialista Obrero Español (PSOE) and Partido Popular (PP). But this bipartidismo (bipartisanship) is about to finish. This time four different parties aim for the presidency: Ciudadanos (C’s) and Podemos are very close to the big parties in the polls. 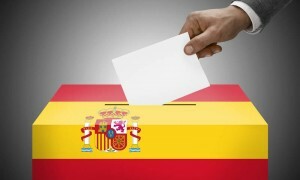 Therefore, today on www.spanishviaskype.com we’re going to learn political vocabulary and words about the elections. So, if you live in Spain and you are learning Spanish, you will be able to understand TV news, the papers, radio programs… You will not hear any other topic during this week. Los políticos (politician): those “reliable people who like to spend their time and money helping us”. Los candidatos (candidates): those people who will promise you the Moon if you help them to be the president of your country. Los partidos (the parties): group of people with the same ideology: winning the election. Los votantes (voters): we, people with the power (at least one week every four years). Apoderados e interventores: they are the representatives of the parties who have the mission of checking that everything is working under the law… and trying to sabotage other’s work. Los diputados (the member of the parliament): people with a life salary, who have been elected to vote the laws in the Congress or, at least, to be sitting on their escaños (seats) surfing the internet. El presidente (the president / prime minister): the most important person in the country; that person whose hair will turn white within the next years. El tránsfuga (the defector): those politician who betray their own party. Changing your opinion… what an undemocratic thing! El voto (the vote): un derecho (a right) that is so boring to exercise for some people and so difficult to get for our grandparents when they were young. Las papeletas (ballots): Look out! Don’t break or stain them or they will be a voto nulo (invalid ballot). Even slices of chorizo have been found inside. La urna (ballot box): Where you put your hopes, complaints or anger in. El Congreso (the Congress): la cámara baja (the low chamber), that place where los diputados gather every Wednesday, discuss the laws, fight, and finally they go for a drink. El Senado (the Senate): la cámara alta (the high chamber) is the place where all the provinces are represented but nobody knows what it is used for. El escaño (the seat at the Congress): these chairs are similar to “the Iron Throne” (in Game of Thrones series): everybody say they are very uncomfortable because of the responsability that imply, but nobody wants to leave them. Well, here you have a brief guide to follow Spanish elections. We hope you enjoyed our ironic humour and if you want to learn Spanish via Skype, don’t hesitate and reserve a free trial lesson here: we will not promise you anything, as politicians do, we prefer to prove it to you.